bitFlyer is Japan’s biggest cryptocurrency exchange, and one of the biggest in the world. It launched in 2014, and added separate US- and EU-based operations at the end of 2017. It enables a variety of advanced trading options, but despite catering for intermediate and experienced traders it’s also highly suited to beginners, owing to its simple dashboards and strong level of security. It also lets customers trade either euros or US dollars for bitcoin, something that isn’t always possible with Asian exchanges. However, bitcoin is currently the only cryptocurrency it offers at the time of writing, so people who want ethereum, ripple or monero will need to look elsewhere for the time being. Otherwise, it’s a secure and reliable exchange. Deposits in euros are free with bitFlyer, while withdrawals in euros are EUR 0.30 for sums under EUR 250,000 and EUR 10 for sums over EUR 250,000. As for bitcoin withdrawals, these are charged at a flat rate of 0.0008 BTC. This makes bitFlyer slightly more expensive than Binance and Poloniex, for example, but cheaper than mid-priced exchanges such as Kraken and Bittrex. Launched in April 2014 in the wake of the Mt Gox hack, bitFlyer is the biggest Japanese exchange trading in bitcoin. It was founded by Takafumi Komiyama and Yuzo Kano, who both previously worked for an investment bank Goldman Sachs in different roles (Komiyama was a developer, Kano was an equity derivatives and convertible bonds trader). While bitFlyer features a variety of advanced trading options suited to experienced investors, it’s an accessible exchange that’s less intimidating to crypto newbies than some of its rivals. It’s partly thanks to its balance of accessibility and complexity that it’s grown into one of the world’s ten largest bitcoin exchanges, having launched trading in the US and in the EU in January 2018. As of writing, customers in these two areas are offered trades only in bitcoin and euros (or US dollars if you’re in the US), but bitFlyer has plans to add such altcoins as litecoin, ethereum, ethereum classic, and bitcoin cash. Even though this gives customers limited choice, the exchange compensates for this with low fees and high levels of security (more below). In addition to these system-level security measures, bitFlyer also enables customers to use two-factor authentication to log into their accounts and complete transactions. It also requires them to verify their accounts, something which is necessary if they wish to gain the “Trade Pro” account classification which enables unlimited deposits and withdrawals. While bitFlyer allows for such advanced trading options as stop and limit trades, its website and user interface is clean and uncomplicated. The “Home” dashboard is very simple, showing the user their total assets in bitcoins and euros, as well as showing the 24-hour change in value of their assets. 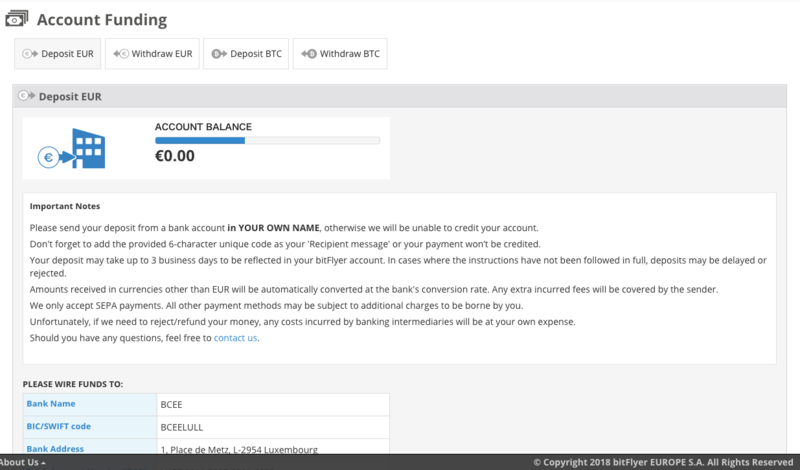 Depositing and withdrawing funds is also simple, with a separate page enabling customers to pay euros or bitcoins into their account and to pay them out. 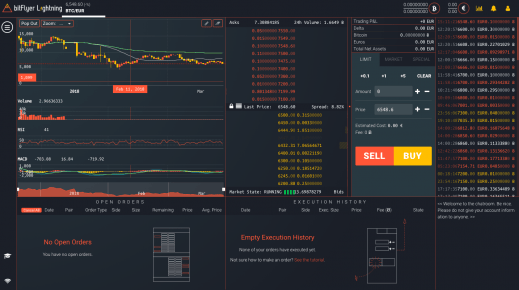 As for trading, this takes place on a separate dashboard, dubbed “Lightning” by bitFlyer. 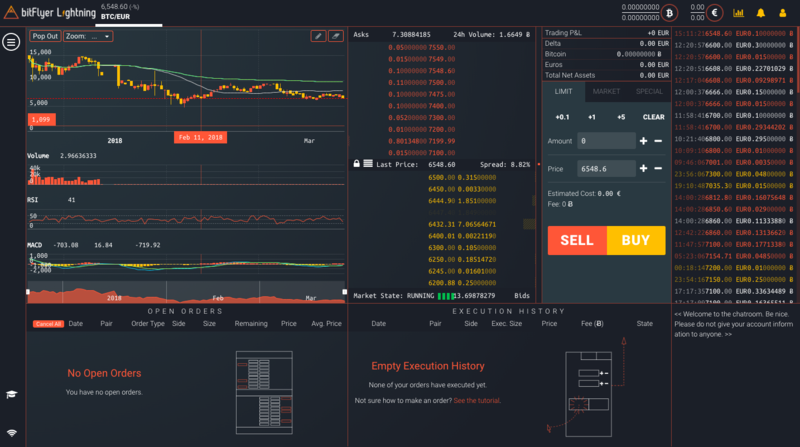 Here, users will find the usual graph that tracks price averages and value movements, as well as columns listing the exchange’s order books and recent trades. It may look complicated at first, but the actual process of purchasing bitcoin can be very simple, with users having the option to conduct market trades that allow them to buy bitcoin at the current market value. Things are made even easier for users thanks to bitFlyer’s mobile app. This is available for iOS and Android, and it lets users make trades, deposit bitcoin, and even pay for goods at retailers that accept bitcoin. There are two ways of making deposits and withdrawals at bitFlyer: bank transfers and crypto wallet transfers. With bank transfers, deposits and withdrawals of euros are possible only via SEPA payments, which can take up to three days for deposits and between one and two days for withdrawals. 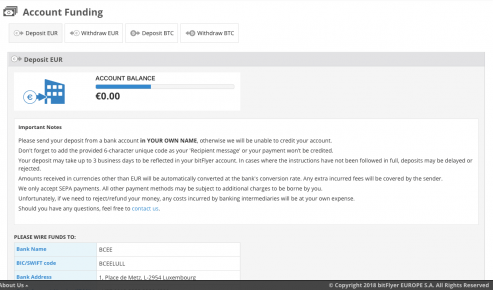 Customers are required to quote a six-digit code with deposits so as to ensure security, while bitFlyer unsurprisingly requires users to deposit and withdraw only to accounts in their own names. With crypto wallet transfers, these are achieved using the usual method: sending bitcoin from (or to) an external bitcoin wallet owned by the user to (or from) their bitFlyer wallet.